These days everyone goes head over heels for anything labelled by a designer. Be it shoes, watches, clothing, accessories, you can just go on and on. Honestly the reason I can think of is that everyone wants to have a feel of something designer, unique, chic and sophisticated. Well if that is you then you sure are reading something that might interest you. 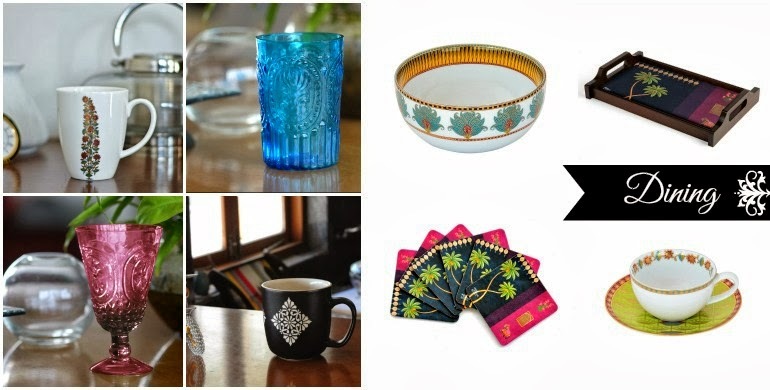 India Circus an online website offers contemporary-chic, sophisticated and affordable style for various area of your life, ranging from home decor, dining, personal accessories and so on. What really caught my eye is the design so Indian right from motives, colours, tones and heritage of Mugal patterns. How elegant would it be to own or receive a piece of craft that is so beautiful yet unique? That said India Circus did take the honour of sending me one of their art piece tray which I will talk about in this post. Its Christmas eve and I am sure everyone is excited just like me. This year I had loads of plans to cook and bake and not bad did to my heart's content, so here I am to share a whole lot of recipes that can help you incase you are in last minute jitters as to what to cook or bake for Christmas or New Year. 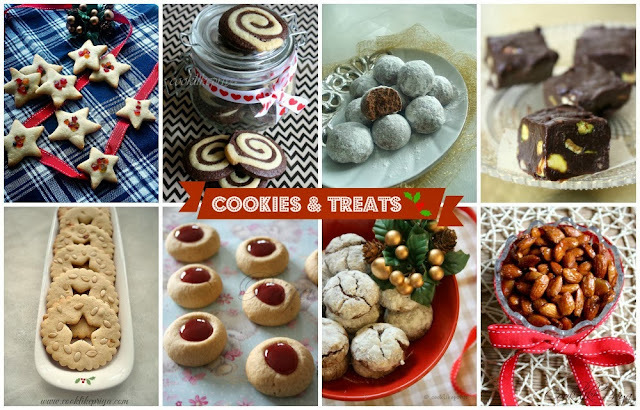 Look no further and without much delay here's the whole list of Christmas & New Year baking and cooking recipes that are listed across meal course and as well as Christmas treats, cooking, cakes and palaharam that you could make for the season. Here's wishing you all a wonderful Merry Christmas and A Joyous New Year's. One more day for Christmas and if you still one of those last minute cooks wondering what to cook/ bake for your family and loved one's. I am here for your rescue :P . Make these warm cinnamon rolls for your breakfast table and surprise your dear ones and you are sure to see a smile on their faces. They are low calorie, eggless and definitely delicious till the last bite. Christmas calls for loads of baking and cooking and I am pretty sure you have this thought of "I am sure going to take a resolution to lose weight the coming year" or "I have to google for a good diet plan", common we all worry but no one worries while eating :P Since this recipe calls for no eggs this is sure a less-fatty recipe that you can try to impress. With no further delay lets move on to the recipe. Oh also you can check out my last minute Fruit Cake/ Plum cake recipe which I have tried over half a dozen times and that has never failed me and more more Christmas menu planning ideas check them here. Along with all the cakes and bakes that we make for Christmas Amma always makes a list of palaharams to distribute for near and dear. 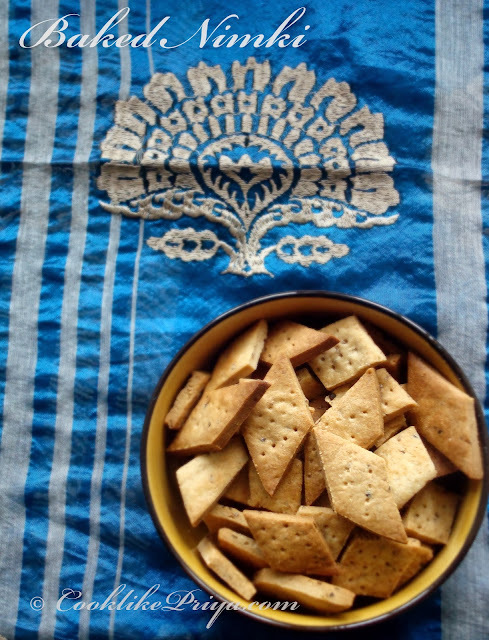 Last week I posted Kulkuls which is more of the sweet snack (palaharam) for Christmas, this savoury diamond cuts is a savoury/spicy snack which is very simple and quick to do. I hope you are all set for your menu for Christmas and you can find more Christmas recipes here. Christmas means many things to many but for me the whole reason and season for Christmas in Jesus himself. Although I was born in a Christian home and had all the access to anything gospel, my knowledge and acceptance of Jesus as my Lord is something I consider personal choice. You know what I mean no one forced me into anything. Each of us have our own faith and we learn as we grow. I am a strong believer of God and that inevitably shows. I do accept people for who they are and not for what they believe, you see faith is totally a sensitive topic to anybody. Today not like other days I just want to share with you something that touched me years ago when I was young and in a fragile state of mind. I was out in one of my uncle's place and I was sunk in my own thoughts as to why something that I expected never really happened. And I had a series of things that happened just exactly what I feared. Hmmm and that moment when I was trying to divert my mind and attention to almost anything or anyone I read this line in a book that caught my eye, it read like this " God does not give us what we want but what we need" I was blown away. Really it spoke so much to me that my whole perspective as to why and what and how turned to there could be a reason why this happened. Only someone who has a relationship with God really understand what those lines meant. And ever since I have this phrase reverberating in me when things don't turn out the way it should. May be that is something that you must also think about. Be blessed! You must be knowing by now that I am a band wagon for simple snack cakes, I love to try and experiment with snack cakes. To be honest I had this bad experience with apple in a cake, I must admit that the last time I made an apple upside down cake it was a disaster since I used a spring form pan and the apple juices got spread in the oven. Silly me did not realise this or rather plan this before doing the recipe. 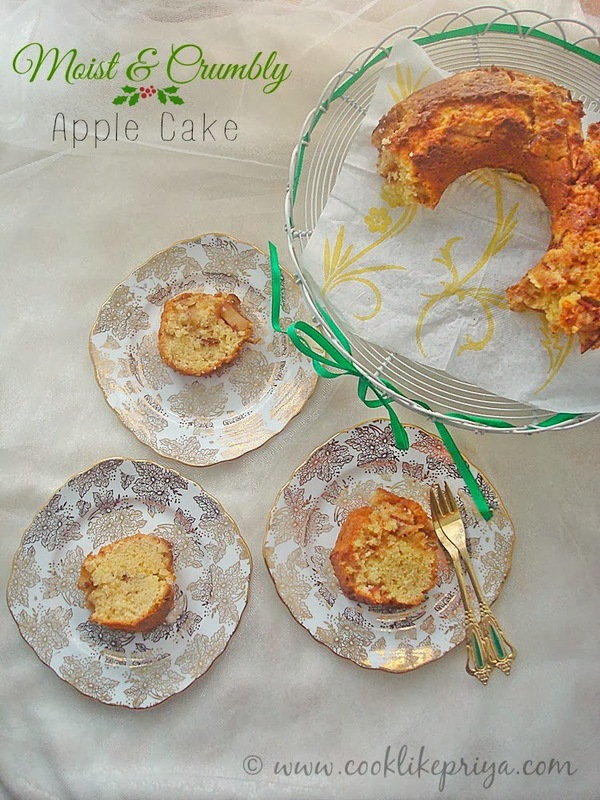 That said I seriously loved the mild flavors of apple & cinnamon in this cake that is so well hugged by a soft spongy cake. Impatient me jumped to cut the cake and had the cake falling apart, but I managed to cut few decent slices and here we go ;-) so don't be in a hurry like me. If you are someone who does not like the Fruit/ Plum cakes for Christmas then you can give a go to this simple yet delicious cake, it tastes great the next day. Wow its just 8 days to Christmas and sure the Christmas Spirit is real high for me :-). This year like always I have a huge list of bakes and goodies that I plan to make and distribute for friends and family. I must say that nothing like home goodies ads gifts for this Christmas. I am sure many of you loved to receive gifts that are homemade. I made these spiced sugar cookies that have a lovely flavour that is similar to the flavours your get in a Christmas cake (Christmas Plum cake). Isn't this great? well an experiment in the kitchen turned success is what I would call this recipe. Although I see so many coloured cookies doing rounds over the internet I love recipes that are simple and easy to do which taste wonderful. I sure can say that this cookie is of this category. Christmas and baking does ring bells to me ;-) I still remember a few years back when I did a Christmas Cake that tuned hard as stone ;-) of course it was way before my life as a blogger. The reason I brought this up is that if you are new to baking don't be worried disasters happen and we must learn our mistakes and keep trying until we get them right. If there is a baker that told me that not one of their bakes was a disaster I will sure have a good laugh. No one is a born expert we all learn, relearn, explore and create. Baking of course is science in pure sense but if you have a good recipe then you sure are going to have a good result. Well enough with the rambling and yes this is one fail proof recipe that may be you should give a try. I am sure it will turn out just perfect. Sugar cookies or old fashioned sugar cookies are sure in a baker's list to bake for Christmas. They are pure easy and can be packed in goodie bags and distributed in parties. They are firm on the outside with a sift inside and not too firm like our Indian variety of biscuits. Sugar cookies have a buttery flavour along with a dash of vanilla. 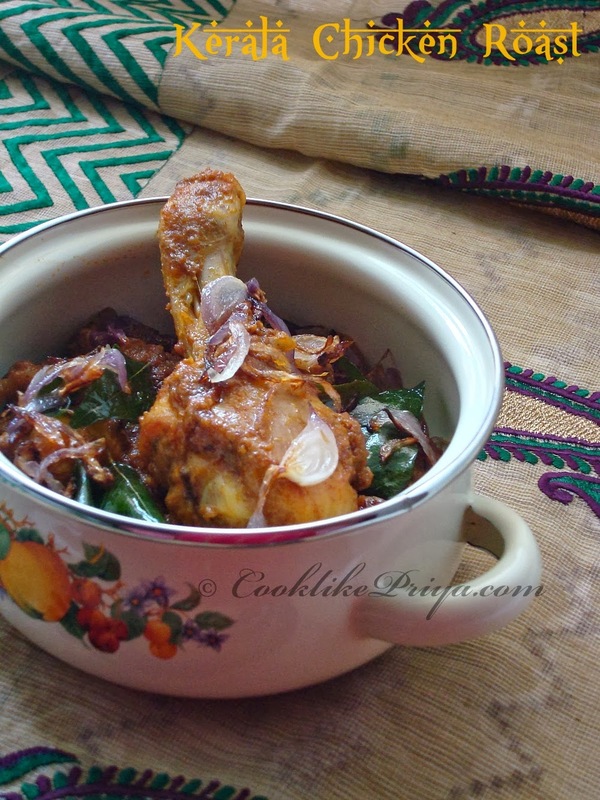 Arusi Paruppu Sadam is a famous Kongu Nandu Recipe, from South India. Almost most homes in Coimbatore and nearby towns cook this sadam of rice and thoor dal. Today for a variation I made this Tamilian favourite rice dish along with Thinai/ Foxtail Millet. I must share the goodness of millets and why our forefathers ate them, they are filled with fibre, proteins, minerals and vitamins. 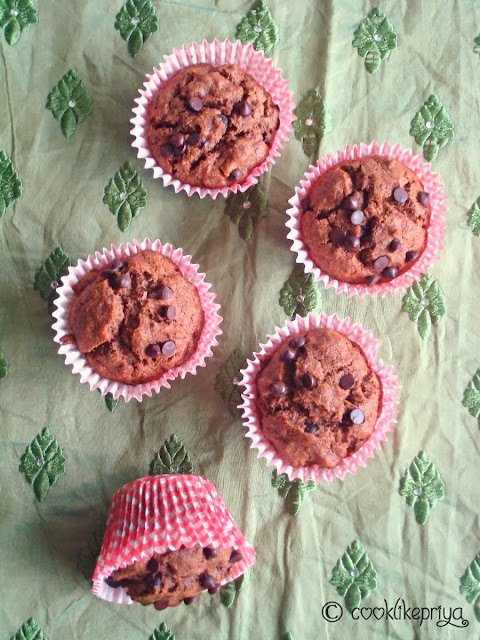 They are so filling and yet gluten free, a great addition if you are someone who wants to diet but eat healthy. Since they contain complex carbohydrates they are great for diabetics. Nowadays with the boom of many organic stores in India we find these millets priced high but mind you millets are in general organic because of the nature in which they are cultivated since they are resilient to pests. 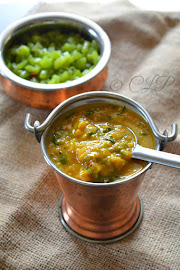 I must tell you that I am so loving this combination of millet and dal makes it wholesome with added vegetables. I felt so full just like eating rice but I know this is sure a healthy alternative to white rice. Foxtail millet does not have any distinct taste like brown rice, they are bland and require flavouring or can be paired with curry. Kulkuls / Kalkals / Kidyo is one of my favourite snakes during Christmas. Amma usually makes a small batch that serves for our family. Not only does she make this during Christmas but otherwise too. I can't believe that we are in December 2013 and this sure was a speedy year. Since there are 16 days to Christmas I thought let me share our family favourites during this season. 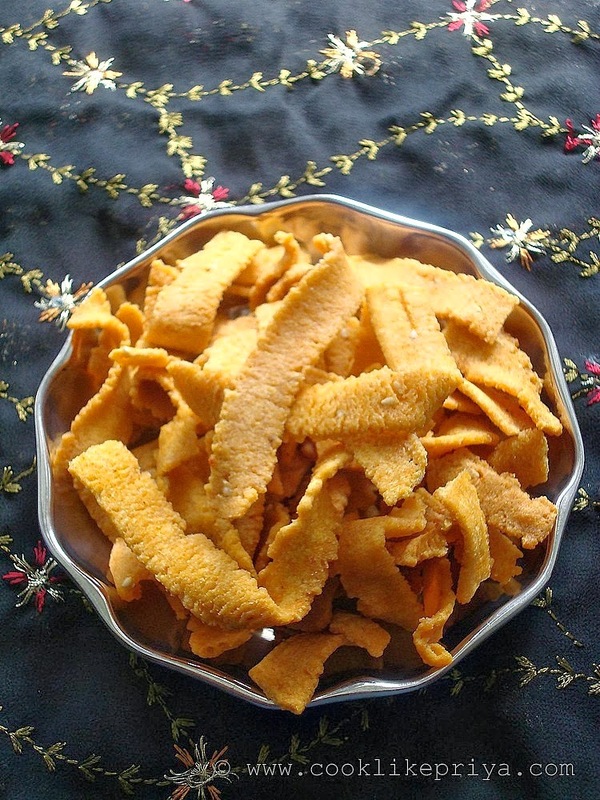 Being Tamil Christians we make lots of edible goodies that we call as Palaharam. 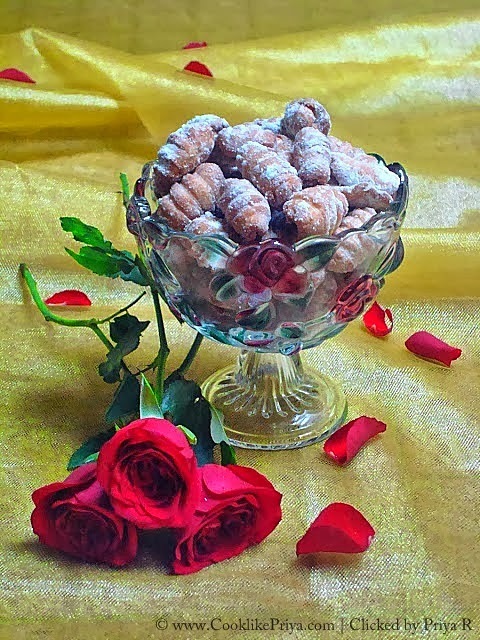 A good list of 8-10 sweets and savouries that are made in a huge batch and served as gifts to friends and family every year. This year I am trying my best to be a good wife and make palaharams at home ;-) hopefully my family enjoy them. Christmas is a season to celebrate the birth of Jesus into this world. Just as the Father gave us His son, Christians everywhere make goodies and distribute them. Not only edible gifts but other gifts to near and dear. Lets celebrate the true meaning of Christmas and stay close to our family. Kulkuls are traditional Goan sweet snack traditionally made for Christmas and served to near and dear during the festive season. They are deepfried and sweet, but the version I have shared here is partially sweet since I wanted to use powdered sugar I did not add much sugar to the dough. You can go ahead and increase the sugar content. The texture of Kulkuls are a firm outside and soft inside. The trick is in shaping the kulkuls so take care and practice a few times to get the exact shape. Vazhaipoo / Banana Flower is a large reddish blossom that grows along with bananas and interestingly every part of the banana plant is used for cooking recipes in the Indian cuisine. Much as banana flower is popular I must admit that cleaning them is sure a challenge, but after you cook them you can be sure that it was worth all the effort. I must say that banana flower is very good for women in particular and has many medicinal values which are sure to be considered while you plan to cook them up. 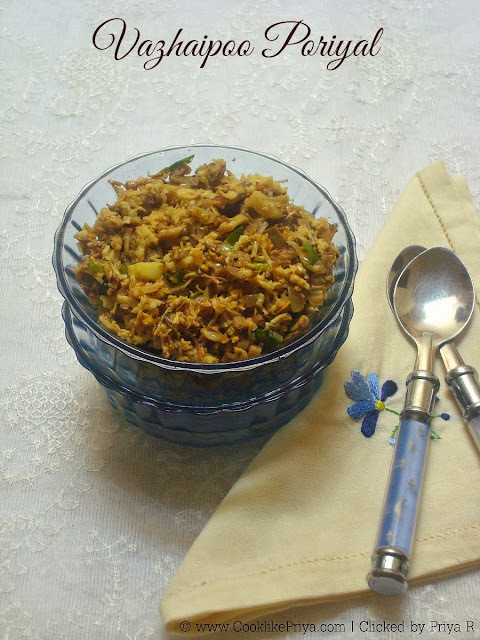 Vazhaipoo poriyal is a mild tasty vegetarian stir fry that goes well as a side to rice and curry. This is a basic recipe that you can try if you are cooking vazhaipoo / banana flower for the first time. Take note that I have used one entire banana blossom for this recipe. Marriage has taught me all things tea ;-) since my husband is a coffee lover I am so bored over coffee that my morning is never complete without a fragrant tea. 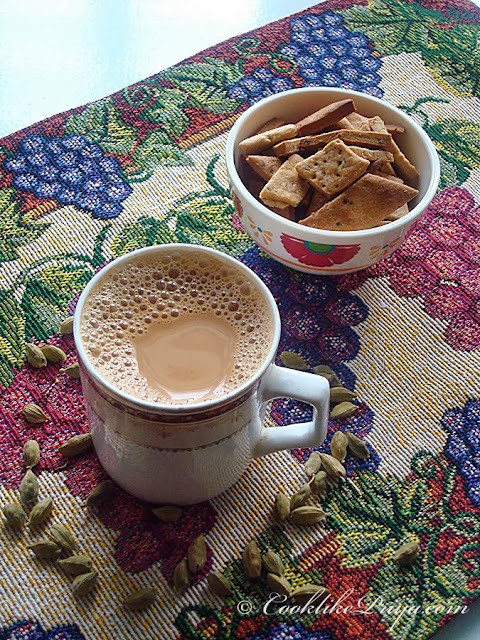 A few weeks back I had posted my favorite Cardamom Tea and Sukku Kaapi (Dry Ginger coffee)today I want to share another version of tea which is really soothing and it is Ginger tea. In fact you can do a fusion of Cardamom and Ginger tea for better taste. 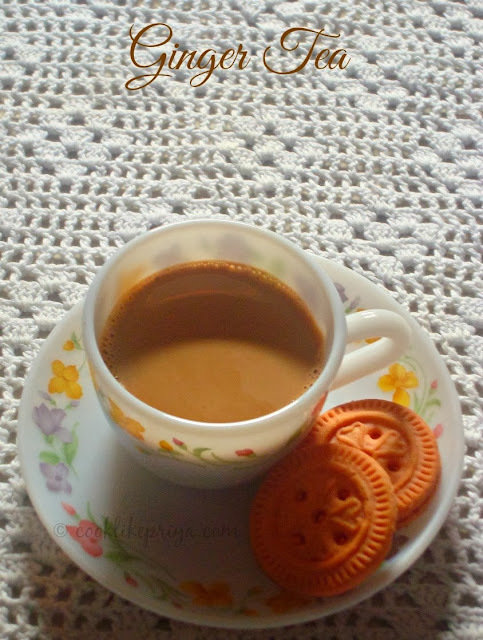 So with my hot cuppa I am so glad to invite you over for today's post. in my hometown you will find many tea wales selling ginger tea in huge carriers that they transport in cycles and for just a mere Rs4 you will get awesome fresh and piping hot ginger tea. Diamond cuts are my all time favourite, but of late I am starting to love the savory ones. 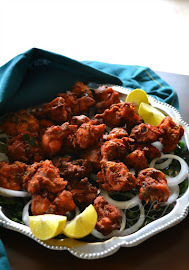 During my last visit to Amma's place she made me masala diamond cuts and boy I was so so excited, the deepfried kind. I still have those clicks sleeping in my draft I've been waiting for Amma to pass me the recipe. So the otherday my hands were itchy to bake, yea yea you read it right :P once you are a baker you seem to think that anything can be baked, I mean you talk and dream about baking. And I for sure am a bit nutty baker, I dream and have sleepless nights about what to bake, how to bake, what combination, which frosting :P sounds funny? well I think its absolutely normal to understand this if you are a baker too. So I thought my not do a baked version of savory diamond cuts and the result was superb. Mind you no maida (APF), no ghee, no butter and I still managed to bake decent looking and great tasting diamond cuts or Nimki or Namkeen or Namak Paare. I spiced the dough up with crushed peppers and it tasted fantastic. So during this festive season so something a little guilt free for the one's who cannot take the deep fried and no sugar goodies. Biryani is one of the most adored recipe in our family. It all started from the time I was a kid, every Sunday lunch menu would be a special biryani from Amma mostly Chicken Biryani and occasionally Lamb biryani. 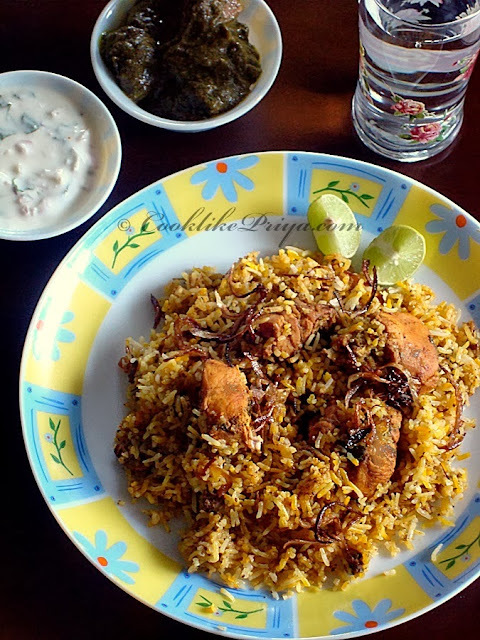 Long back I posted a super simple Chicken Biryani Amma Style but over the years R & me have explored so much when it comes to Biryani and one version that usually makes us crave for would be the Hyderabadi Mutton biryani and today I wanted to do a twist to this recipe make it using Chicken and a restaurant style Chicken Hyderabadi Biryani. Usually when you order for any biryani in a restaurant you will 90% not find whole spices likes bay leaf, cinnamon stick, star anise and so on in the biryani and the only visible ingredients would be rice, meat, onions, tomatoes and at times mint leaves. I was intrigued by how they can come out with such fantastic taste despite not adding the whole spices. When I did my research to find a restaurant style chicken biryani I bumped on this recipe by Vah chef and the next weekend I made this for our Sunday lunch. It was a perfect restaurant style biryani :-) you have to try it to know how great it tastes. Poori is a childhood favourite for R and me :-) we both love it so much hence I make it once or twice a month as a breakfast recipe. Like always I love to have twists to usual day to day recipes and this time I tried Palak Poori (Spinach Poori) and my husband totally loved this flavourful poori :-) and what a great way to add spinach into the menu. 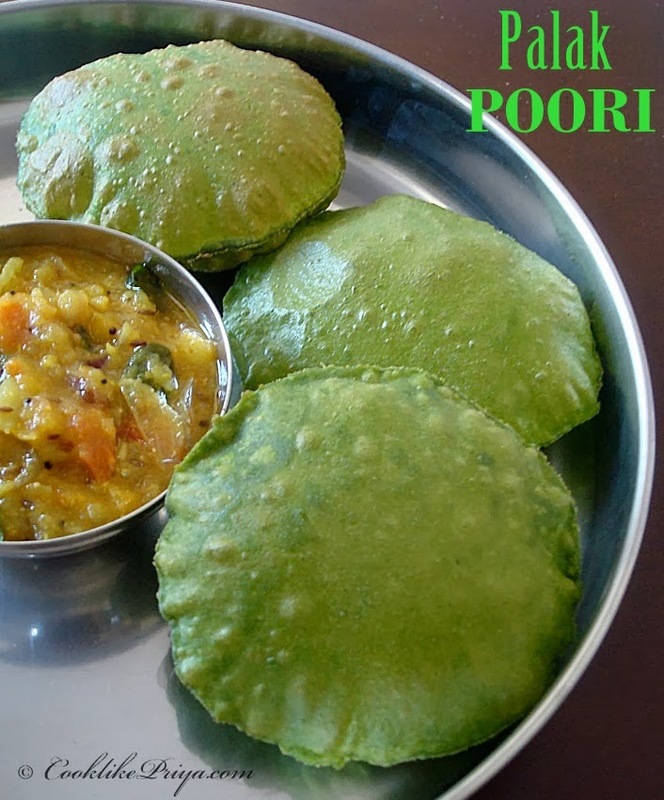 I would not say that its the most healthiest way but a cheats' way to include greens into meals ;-) try this poori for fussy eaters and I am sure they will love it. The secret ingredient in this poori is the use of fennel seeds, it does give a lovely flavour to the poori. The biggest tip to make perfect poori is to make the dough stiff and firm and not soft like how we knead the dough for chappati. I love Indian bakery goodies, and of all the different bakes my most favourite is Nan Khatai and since its festival season I thought why not doing a twist with the traditional Nan Khatai by making it a Saffron flavoured. 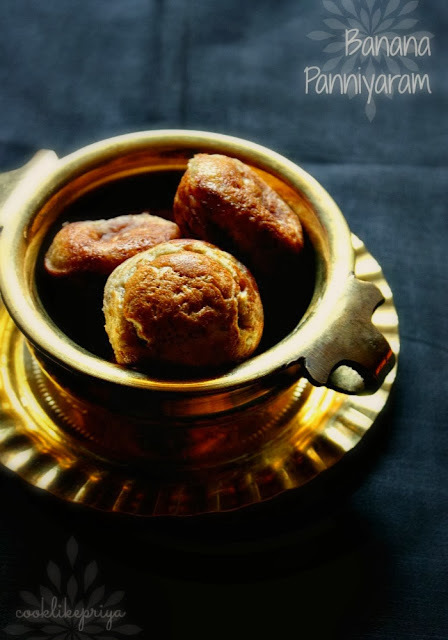 Nan Khatai are buttery melt in the mouth cookies and have a crumbly texture. 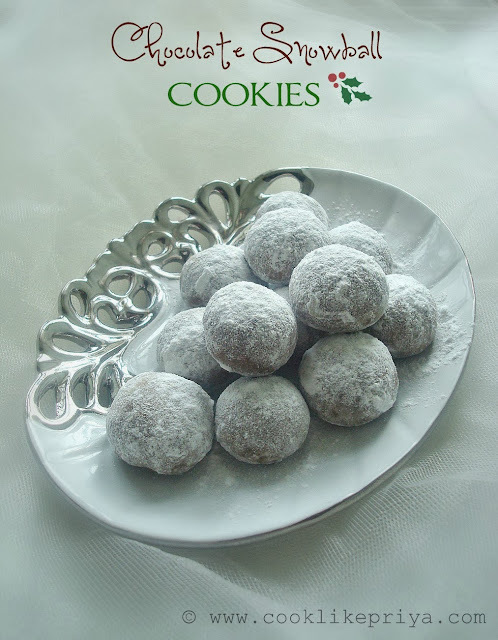 The cookies are great as a snack and can be wrapped as a treat for guests or kids. 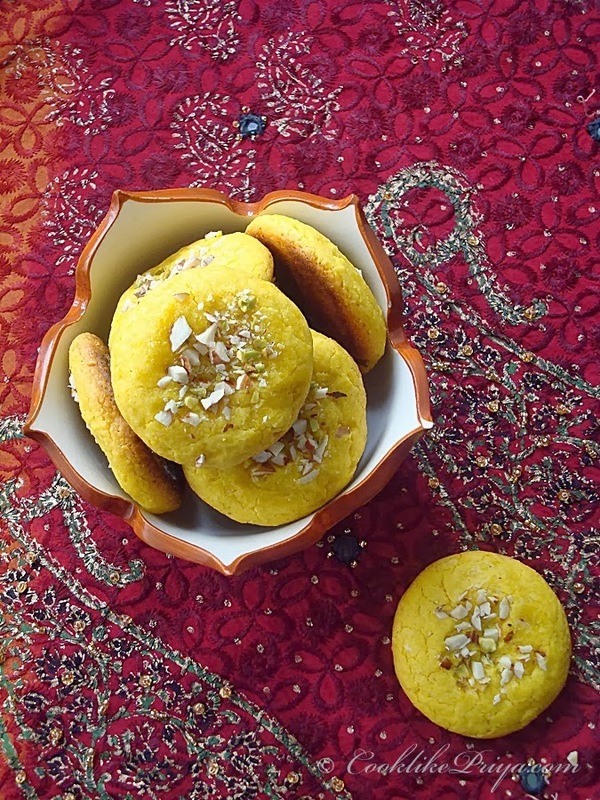 Saffron Nan Khatai are firm on the outside with a slight mithai flavour on the inside. The topped nuts add to the crunch and taste. 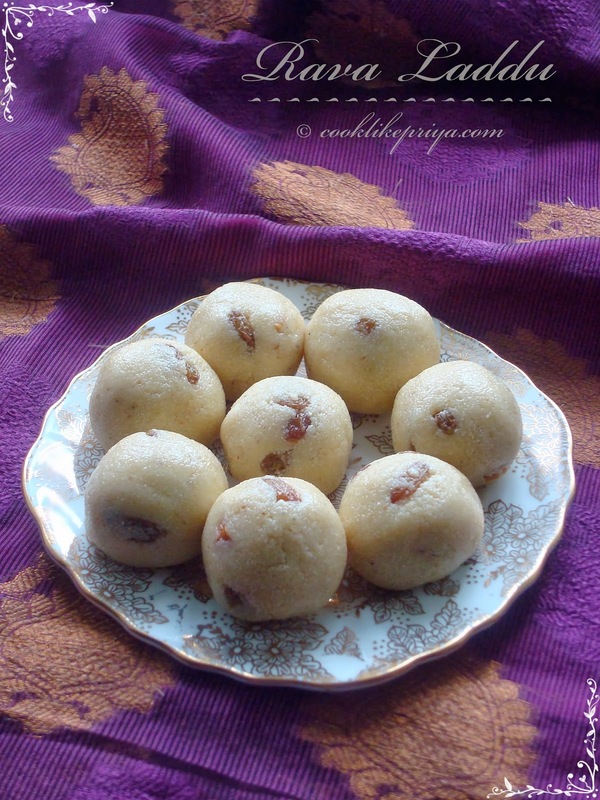 These colourful Saffron Nan Khatai are sure a joy to taste and attractive looking. Give this a dry during the festive time. Mutton Kheema Cutlets are a big hit at home, Amma makes it so well and as kids we never complain to eat them :-). She made sure to do it once a month and when everyone is at home. A super simple recipe and you can even do it ahead and then shallow fry them when you want it. The minced meat is pre-cooked and made into dumplings along with mashed potatoes and spices. Later coated with batter rolled on breadcrumbs and then shallow fried. 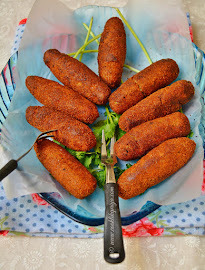 You really do not need a side to dip these cutlets they taste great on their own. 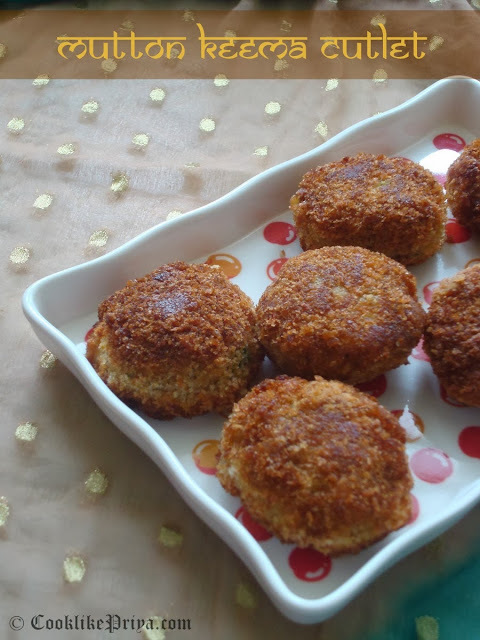 So last weekend when we had friends over for lunch I made these as a starter and they simply enjoyed these Kheema cutlets a lot and everyone wanted a second and third serving ;-) I couldn't be more happy. Have you ever tried something and it ended up as a kitchen flop and never had the guts to try it again? well that's me. Last year around this time I tried this Mysore Pak recipe and it ended up in a Mysore Fudge all gooey and although it tasted pretty ok I was not so pleased with it and decided to bin it. Seriously felt bad that I wasted that amount of ghee. 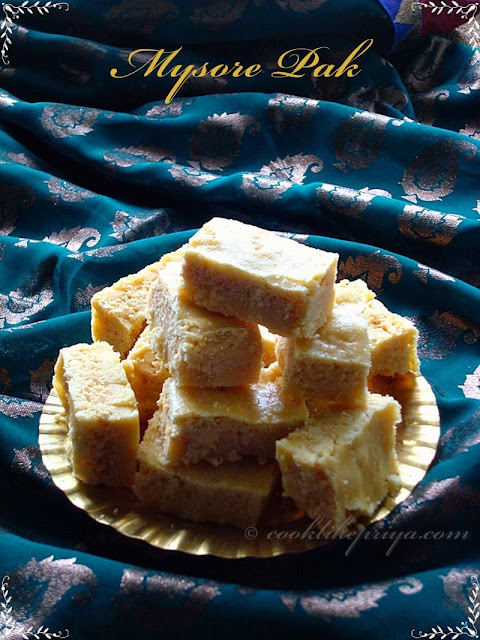 After a year I am back again with doing this recipe of Mysore Pak and it turned out just right. 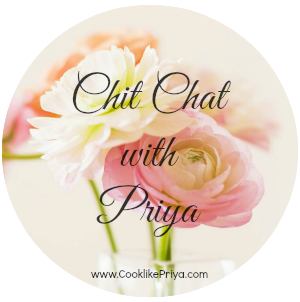 Nevertheless I have conquered the fear to try mysore pak at home and have been waiting to hear what my husband has to say about it as I try to type this post here. Will update the verdict soon :-) I promise. 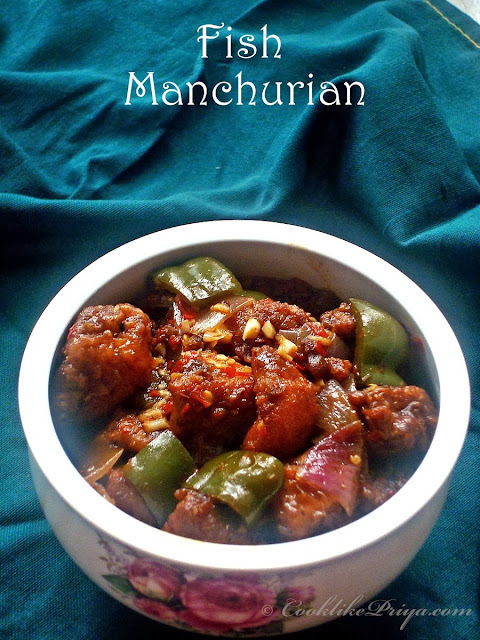 Divya thank you so much for this lovely recipe, all credits to you. Banana Bajji, Banana Chips, Banana cake anything bananas I go bananas ;-) I love every cooked variety of banana recipe but somehow I do not enjoy eating this one fruit as a fruit. Note I never said I hate it, I simply do not enjoy it. Being a fruit lover and a blogger, I do try to cook with fruits often. But this banana paniyaram is something I have been hooked onto as a teenager. Amma usually fried this batter in oil, they are called Pazha Appam but I love this paniyaram version better since it is less calories. R on the other hand has never tried any kind of banana recipes other than the bakes that I do now and then. This version of paniyaram he loved it so much. I served it alongside tea on a sunday evening. 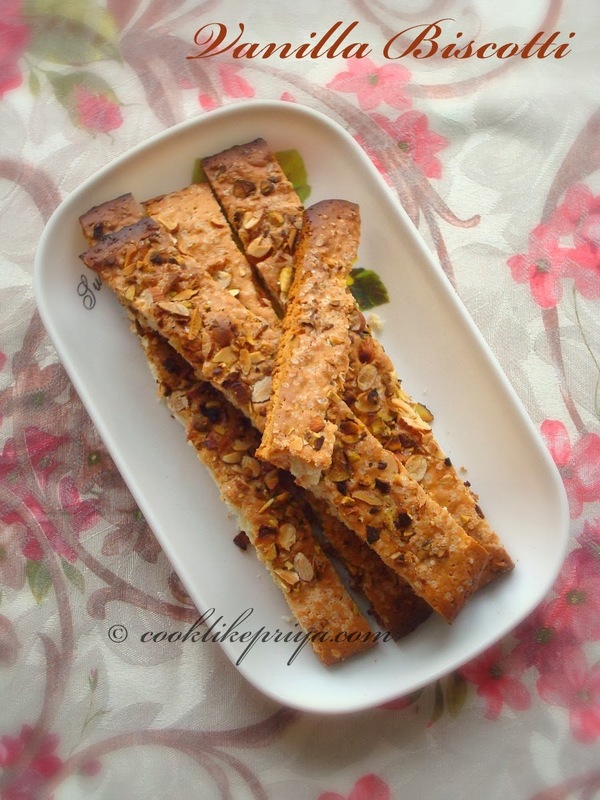 Banana Paniyaram is a quick to do snack when you are craving for something sweet. It is spongy, sweet and light to bite. 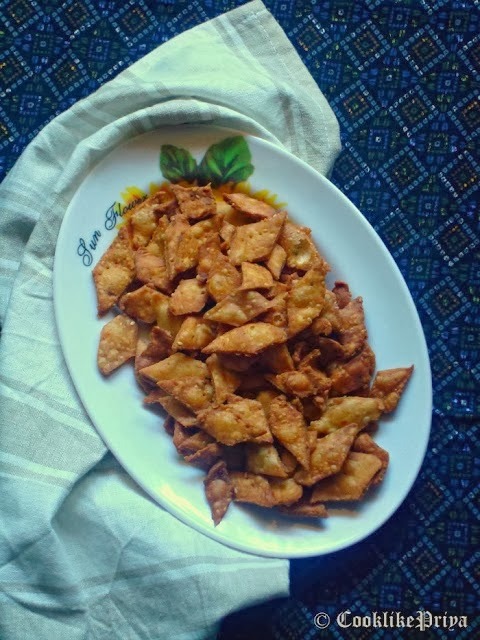 I have sweetened the batter with jaggery syrup, you can even use palm jaggery syrup for a more healthy alternative. For diabetics you can make it with sugarfree. Reshmi Kebab is made with marinated chicken in full fat cream, pepper, kastoori methi (dried fenugreek leaves), mint leaves and salt. 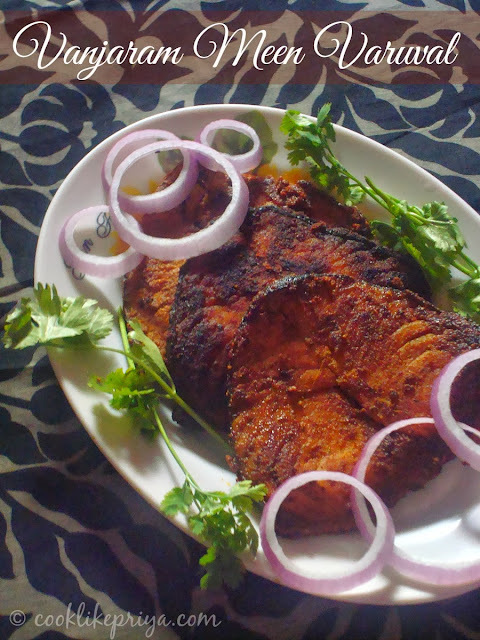 This tender meat is then oven broiled to get a perfect tandoori effect. 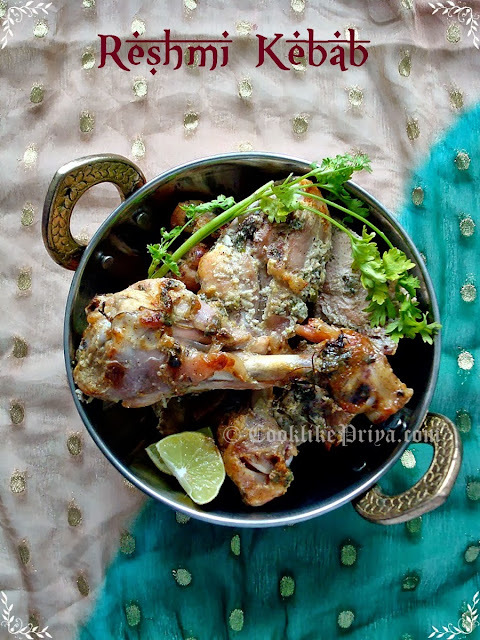 Its mild in spices and you do not need any artificial colouring, yet the chicken is succulent and juicy holding its flavours. It was again another weekend and I was busy in the kitchen to stir some recipes. 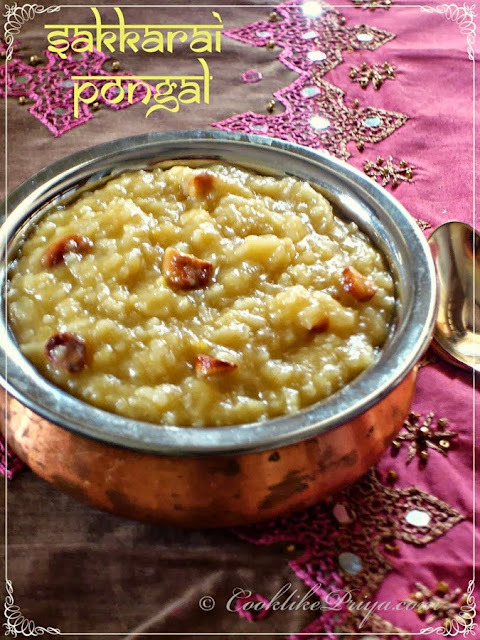 I had a sweet tooth calling hence made this simple apple lapsi which I had bookmarked long back from my dear friend +Preeti Tamilarasan . Since I had all the ingredients in hand I just went ahead with the recipe as I was cooking other recipes alongside. As I was eager to taste the lapsi when it still hot, I burnt my tongue :-( does this happen to you? and later no matter how much I tried to taste this lapsi after it cooled down I still could not actually taste the sweetness... grrrr I was bit bugged and decided to reserve some for myself in the refrigerator to try the next day. And to my surprise it was too good. 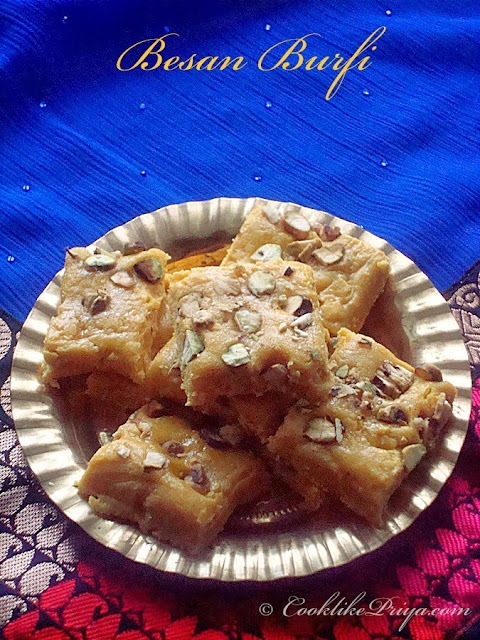 For all those you do not what lapsi is its a famous Rajasthani sweet usually done to feast on important occasions like festivals, marriage feasts and also house warming. 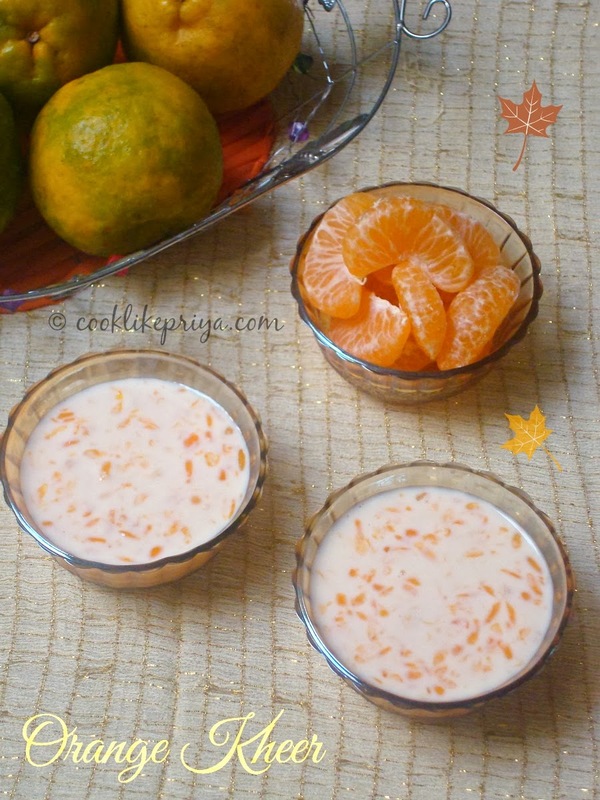 Since all the ingredients are easily found in South India its something we all ought to try. I can say that its a good counter part to the Rava Kesari that is quite famous in South India. 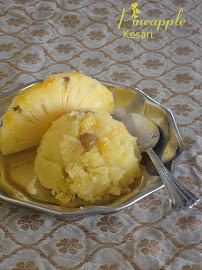 But nevertheless both kesari and lapsi have their uniqueness in flavour and texture. One big favourite of mine from the legume family is Chickpeas. I simply love it in a pulao or curry or even as a sundal (stir-fry). I have posted Chickpeas Pulao and Chickpeas Sundal earlier, so I felt the urge to post a Chickpeas Coconut Curry/ Channa Kurma (with coconut and tomato). That said my husband on the other had does not love like chickpeas in any form. He does not find it interesting or even appetizing to eat...sign... So now you know why chickpeas does not appear on the blog frequently. But I do have days where I want to have what I want to have and made this Kurma just for myself, yes your read it right ;-) I made this kurma with a handful of Chickpeas and there are no words to describe how happy I really was enjoying it all alone ;-) food does make me happy! ;-) How fun would life be if cookies were perfect for diet ??? 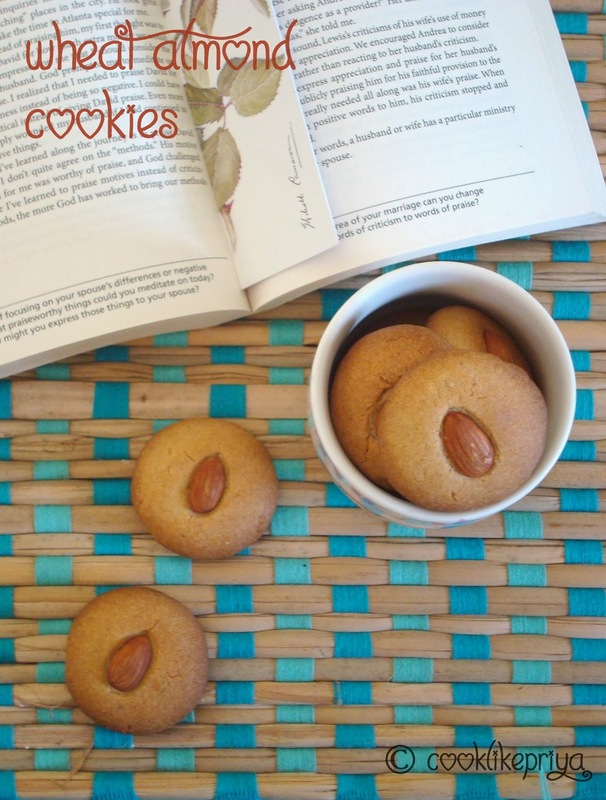 sigh... As I write this post I so miss munching on these buttery cookies that I baked a fortnight ago. I love to bake and the baking bug seem to have vanished now and apparently when I do I seem to do it quite frequently. Does this happen to you? as of now I am on a baking low, so hence to boost up my spirits thought of doing this post on cookies. There cannot be an easier recipe as this for someone who is a beginner in baking. And I have to mention that these cookies don't have any baking powder or baking soda so its kids friendly in every way. 'An Apple a day keeps the doctor away', we all know this but still tell me how many of us have an apple a day? 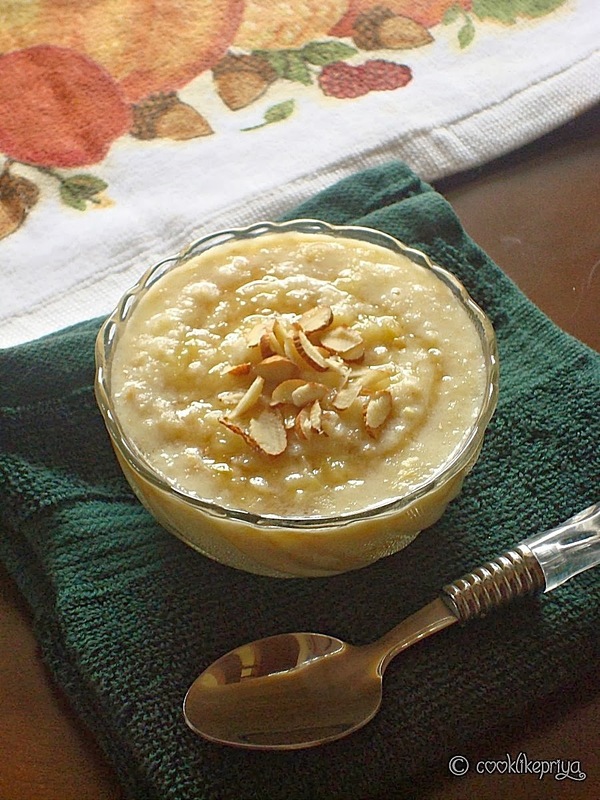 Even I don't, so the other day I had this reader who requested me for a different oats porridge recipe, since I had already posted a savoury version of oats porridge - Masala Oats, I thought why not post a sweeter version along with fruit. 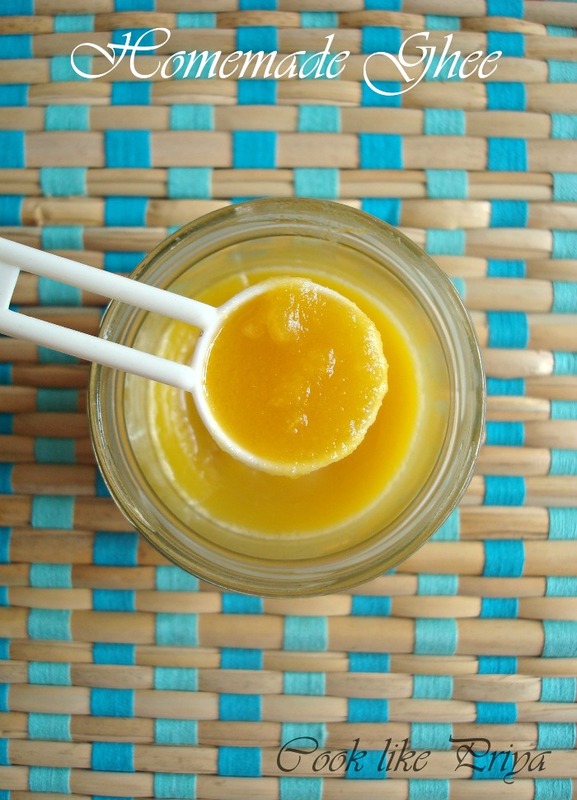 This is sure a quick and simple recipe, you can even serve it for kids. Apple tend to have a natural sugar and I have partially cooked it along with oats and milk to have a sweetened yet fragrant taste. Topping nuts on this oats add a lovely crunch to this porridge, I love to have this warm and even cold both ways it tastes amazing. 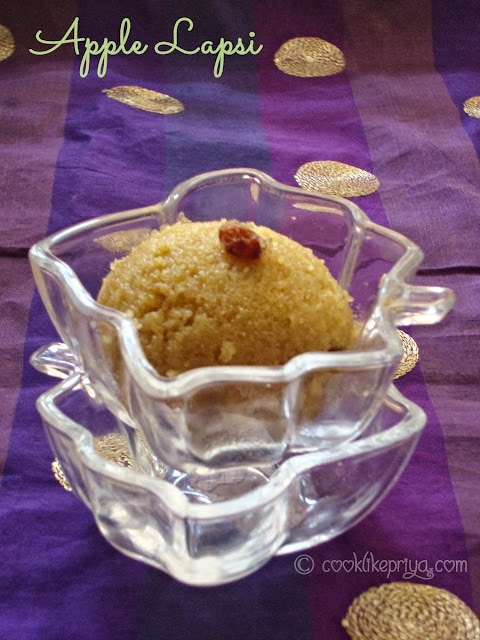 Samba Rava or Wheat Semolina Upma is one of my favourite and go to recipe these day. I simply love to enjoy this upma with Ketchup or curd. There is a slight twist to this recipe and I learnt this from R's aunt who made this for us when we visited her. Also I find samba rav/ wheat sooji at its best in Tamilnadu, in Karnataka we get very course wheat rava that resemble saw dust... grrr.. So on our way back we picked a 5 kg Wheat rava back home :) and ever since I have made this upma countless number of times. You might ask me does this sooji even have a taste? well the secret is in the preparation really. Of course me being me tried various versions of breakfast & dinner recipes using Samba rava which will appear in the blog I promise. 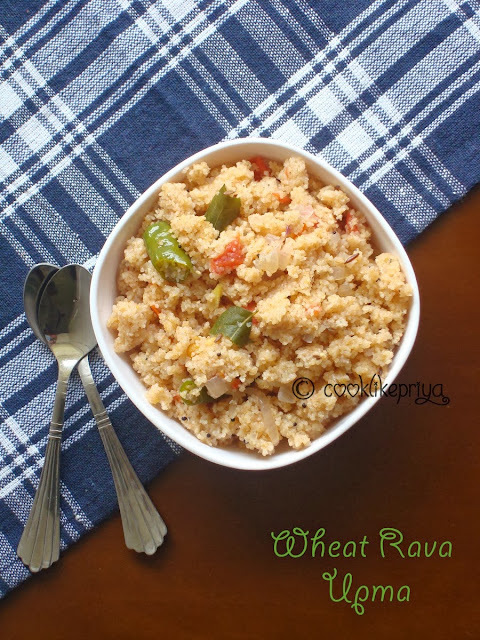 You know many of my friends do not like samba rava and one big reason is that it tastes bland and unlike the white sooji its counterpart which absorbs much flavours samba is a little tricky, but don't worry this recipe will sure result in a great tasting upma with flavour. I have posted earlier a Samba Rava upma which is more like a main which needs a curry to to paired with unlike this recipe here. R & Me are big pickle fans, we always buy a bottle of Priya's Urugai no matter where we are, that crazy. But after marriage comes the idea of making pickle at home. For a person like me who can make pickle at home, I am sure anyone can. I always am this person who would love to wind up all the kitchen work under an hour and that includes cleaning, washing etc. Pickles usually have a long process and I love the shortcut version of instant pickles which still hold and develop lots of flavours. 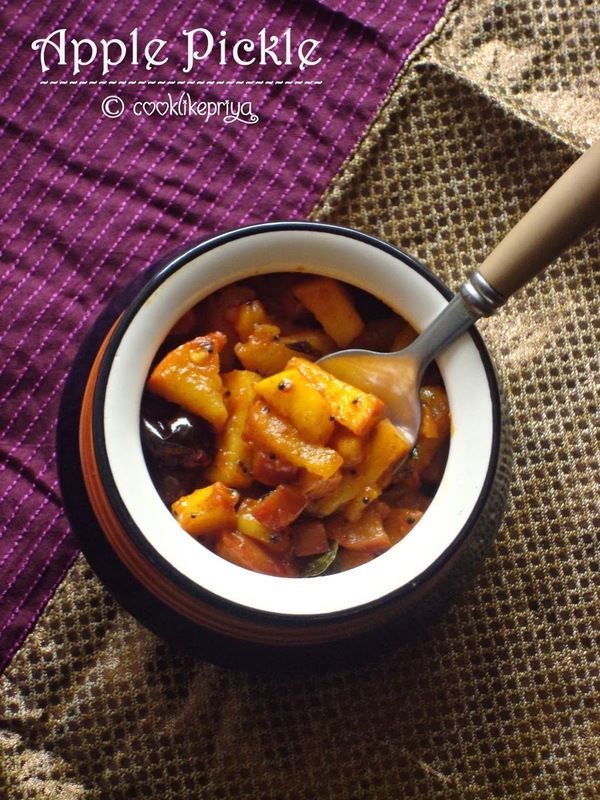 I have few other instant pickles which are a big hit at home Tomato Pickle & Mango Pickle. So the other day I had nearly 2 dozen apples and was wondering what to do with them and I was not looking at a sweet recipe so I got this idea of doing a pickle with apples. The result was fabulous, R loved it so much that he had it with his dosa, idly, rice, chappati and even with curd ;-) the red apples did have a slight sweetness to them I balanced it with lemon juice. 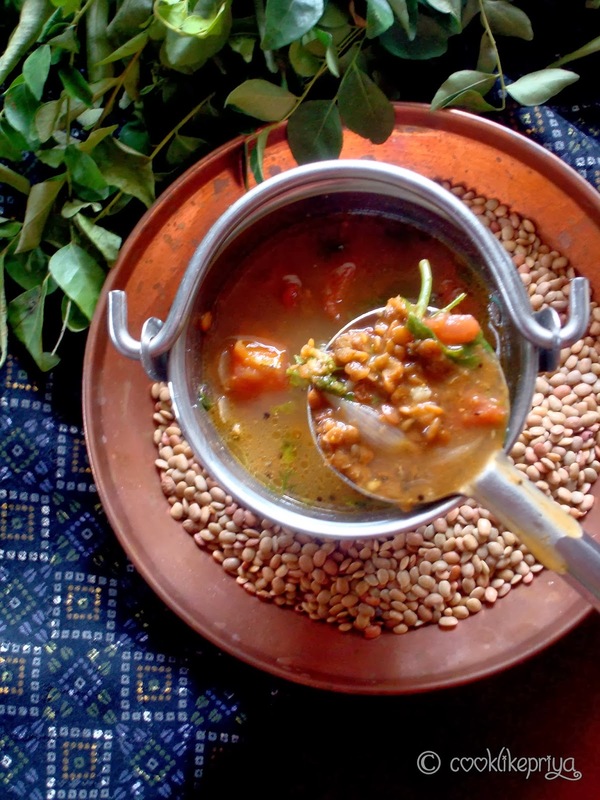 Kollu Rasam is a dish prepared in Kongunadu delicacy usually made to treat cold, cough and even aid weight loss. After marriage only I got to know about this recipe from my MIL and husband. 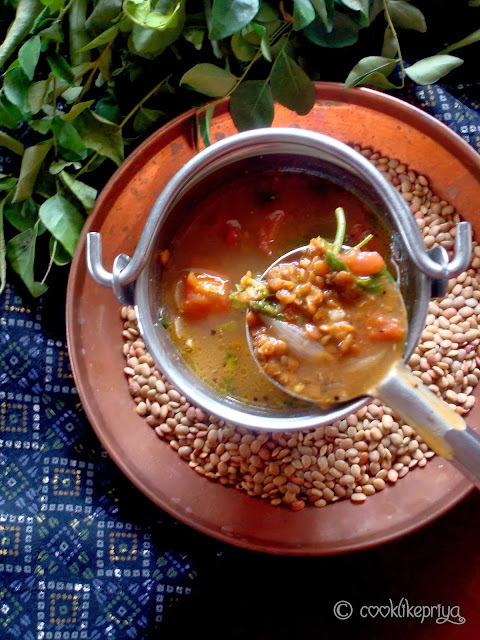 My husband used to keep telling me about this rasam recipe that his mom usually makes at home. I was totally new to Kongu samayal and slowly I am learning how to make recipes one by one. Although there are various versions of this rasam online I am posting my own version here. My MIL usually grinds horsegram after cooking it and then adds to the curry but I used a mashed version of horsegram. I love recipes using Ragi/ Fingermillet, we all know the benefits of this millet and try to use it on our day to day diet. 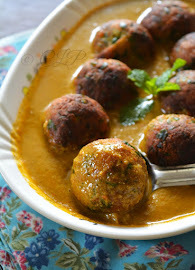 Off late I have been trying new recipes using ragi that I keep posting in my blog from time to time. 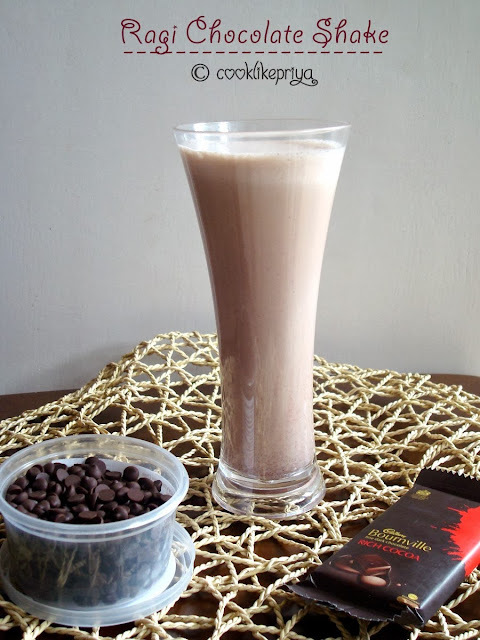 One good thing is that R and me we both love Ragi, I tried this Ragi chocolate milkshake sometime back and I have made this around 4-5 times and before I could think of clicking some pictures for the blog this milkshake has vanished ;-) and the big kid at home (husband) never seems to lose his excitement about this drink. I am sure kids and adults will enjoy this equally. Chocolate Semolina Pudding/ Chocolate Kesari is one yum and quick dessert to make when you are craving for some quick and simple dessert to do for those moments you want an instant dessert for the sweet tooth. I have done this so many times as its R's favourite and it never seems to lose its charm with us ;-) Although my husband is not a great chocolate fan as I am, he still asks me to do this chocolate pudding. I picked this recipe from my dear friend Sangee's blog. Thanks Sangee for this wonderful dessert and now its our family favourite. 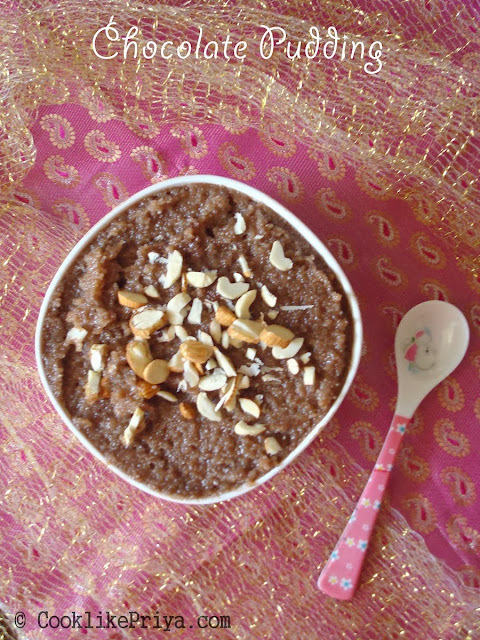 Chocolate Semolina Pudding is more like Rava Kesari with a twist of adding cocoa powder with milk and vanilla essence. The result is a luscious dessert for those sweet moments, you can go one step ahead like I have done and make it with ghee which is totally worth it all. Breadcrumbs are easy to make and can be stored for upto 3 months in the refrigerator covered and packed in a good air locked container. I usually use bread that is about to be stale toast it and then crumble it using a mixer. I later use up breakcrumbs to make cutlets, dumplings and kola urundais. I find the store bought breadcrumbs are too grainy and cost quite a lot too. When we can make breadcrumbs at home why buy store bought bread crumbs? 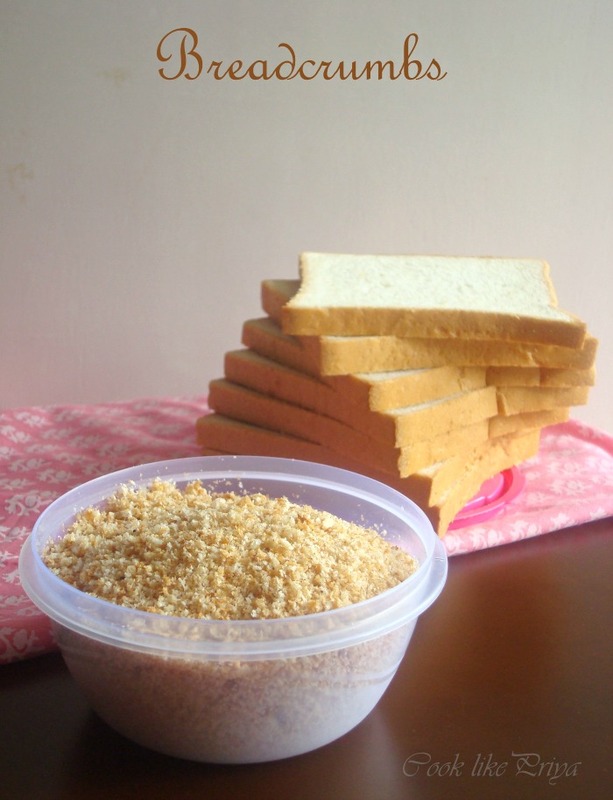 You do not need an oven or a toaster to toast bread, here I have shared a simple and easy way how to do bread crumbs using stove stop method with stepwise instructions. Everyday I hop into my blog, write a few lines put the post into draft to sleep and wind-away. Sheesh these past 3-4 days this the only activity in my blog. I want to post everyday and somehow I just keep postponing. Sometimes I just need a big boost to keep the blogging mojo. I have so many requests from my readers on various recipes, as promised will keep posting them as and when I find time. After a good rest I am back with a lip smacking post of Kerala Egg Roast, a recent favourite among the family. I must tell you that my husband is a picky eater and someone who does not enjoy eggs, can you believe it? I mean he would eat bakes with eggs but its the hardboiled, scrambled and eggy curries that he purely does not enjoy. But me being me does cook with eggs every now and them, not like I am a big fan of them but I do love egg based recipes. This is purely a reason why you would not find many egg based recipes in this space. 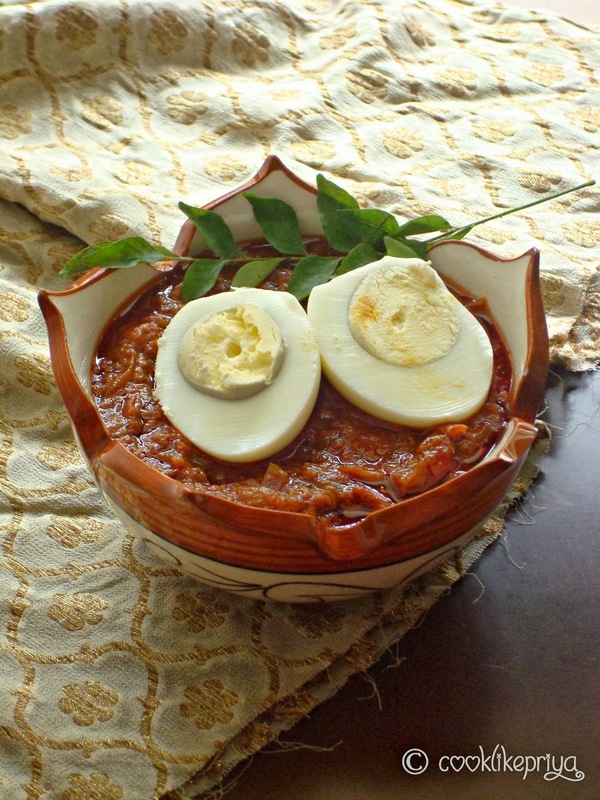 Long long ago I had posted this recipe of Egg Mint Curry, so lets move on to the recipe now. Kerala Mutta Roast is a famous Mallu recipe that goes well with appams, parottas and rice. 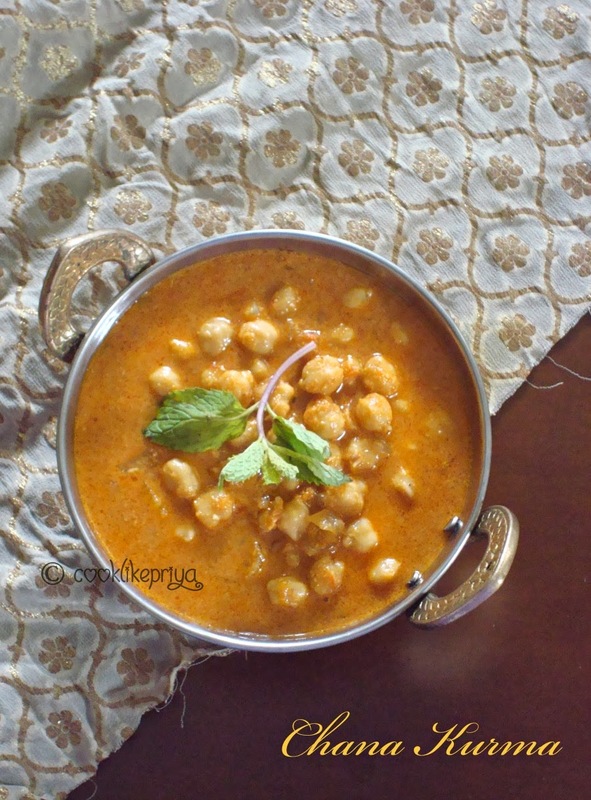 A simple yet delicious curry that is less spicy and easy to make. 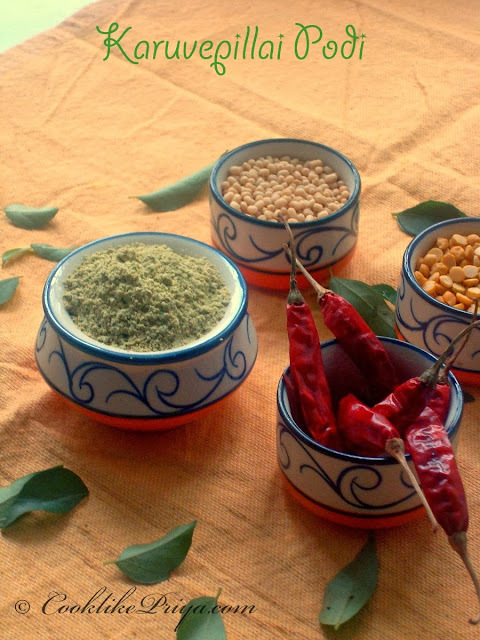 The curry/ masala base can be used to make chicken, beef or pork alternatives. If you don't like boiled eggs simple make the thokku as a side for rice or chappati it is still delicious.